Apryl is a horse trainer and she sent me the link to this following article. If you click on the link, you can read the full article and watch the video of the race. Thank you Apryl! 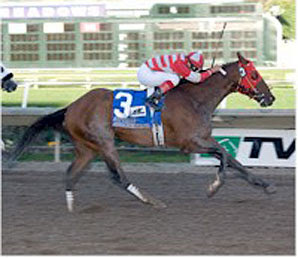 The 4-year-old Autism Awareness, who is owned by Johnny Taboada, won his first stakes since his 62-1 shocker in the El Camino Real Derby (gr. III) at Bay Meadows in March 2008. Bringing just $1,000 as a yearling, the California-bred son of Tannersmyman was ridden to victory by David Lopez for trainer Genaro Vallejo in a time of 1:43.17 for 1 1/16 miles on the synthetic Tapeta racing surface. It was an emotional group in the winner's circle that surrounded Taboada, whose son, Renzo, has autism. The owner has dedicated his life to fighting the illness. "Odds don't mean anything to us," said Taboada, whose son, Renzo, has autism. "There's nothing like winning the El Camino Real Derby, but this is very close. A lot of people around the nation have paid attention to this horse, but they've kind of lost interest. I think they'll be noticing him again."